Margarita Ibrahimoff (born October 26, 1956) better known as Rita Wilson is an American actress, singer, songwriter, and producer. She appeared in the films, It's Complicated (2009), Sleepless in Seattle (1993), Now and Then (1995), Jingle All the Way (1996), The Story of Us (1999) and Runaway Bride (1999), and the television series The Good Wife, and Girls. Wilson has performed on Broadway, and has produced several films, including My Big Fat Greek Wedding (2002). As a singer/songwriter, Wilson has released the albums AM/FM, Rita Wilson, Bigger Picture, and Halfway to Home. In March 2019, she received a star on the Hollywood Walk of Fame. 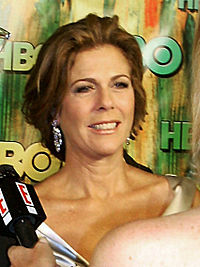 Rita Wilson was born as Margarita Ibrahimoff in Hollywood, California and grew up there. Her mother, Dorothea, was Greek, raised in Sotirë near Dropull i Sipërm in Albania, close to the border with Greece. Her father, Hassan Halilov Ibrahimoff was a Pomak (Bulgarian Muslim) born in Breshtene (Oraio), Greece, close to the border with Bulgaria. Wilson's father moved from Bulgaria to the US in 1949. He converted from Islam to Orthodox Christianity upon his marriage and changed his name to Allan Wilson in 1960, choosing his name after a local street. Rita was raised in the Greek Orthodox faith. Her father in addition to Bulgarian could speak "Russian, Turkish, Polish, Greek, a little bit of Italian, a little bit of French" according to Rita's husband Tom Hanks, who said he modeled his portrayal of the character Viktor Navorski in the film The Terminal on his father-in-law. Wilson's career began with a guest appearance on The Brady Bunch in the 1972 episode "Greg's Triangle," where she played Pat Conway, one of the candidates running against Marcia for head cheerleader. She also twice appeared on M*A*S*H in 1982 as Nurse Lacey as well as the sitcoms Three's Company and Bosom Buddies starring her future husband Tom Hanks, and as Hester Rose Crane, the deceased mother of Frasier Crane on Frasier. She has appeared in numerous movies, including Volunteers, Barbarians at the Gate, The Bonfire of the Vanities, Mixed Nuts, Sleepless in Seattle, Now and Then, That Thing You Do!, Jingle All the Way, Runaway Bride, Invisible Child, The Story of Us, Raise Your Voice, It's Complicated, and Larry Crowne. On television, she played Susan Borman, wife of astronaut Frank Borman, in the HBO miniseries From the Earth to the Moon. She guest starred in many series, including Frasier, Curb Your Enthusiasm, Law & Order: Special Victims Unit, Body of Proof, and had recurring roles on The Good Wife and Girls. She was instrumental in helping actress-playwright Nia Vardalos get the movie deal for My Big Fat Greek Wedding, which became the highest-grossing independent films of all time and for which she served as a producer. Wilson produced two stage productions of the play, as they were developing the film. A sequel, My Big Fat Greek Wedding 2, which Wilson co-produced and in which she had a supporting role, was released in 2016. Wilson's own Greek heritage was honored in 2016 when the Greek Postal Service ELTA commemorated her with a stamp along with five others. The other four depicted on stamps were the filmmaker Costa-Gavras, engineer and entrepreneur Peter Diamandis, journalist George Stephanopoulos, and billionaire businessman John Catsimatidis. In 2008, Wilson produced the film Mamma Mia!, and eight years later its sequel, Mamma Mia! Here We Go Again. In 2006, Wilson made her Broadway debut where she performed the role of Roxie Hart in the revival of Chicago. In 2015, she returned to Broadway in Larry David’s sold-out original play, Fish in the Dark, playing his wife, Brenda. Off Broadway, she played various roles in Nora Ephron and Delia Ephron’s play Love, Loss and What I Wore. She reprised her roles in the Los Angeles production at the Geffen Playhouse. Also, at the Geffen, Wilson performed in Daniel Margulies' Pulitzer Prize-winning play, Dinner with Friends, directed by Tony winner, Dan Sullivan. Wilson originated the role of "Mama" in the world premier of Lisa Loomer's play, Distracted, at the Mark Taper Forum, also in Los Angeles. Wilson's long-standing interest in singing led her to record a debut solo album, AM/FM, which she released on May 8, 2012, on the Decca Records label. The album featured classics from the 1960s/70s, including a cover of "Wichita Lineman" that she performed with the song's writer-composer, Jimmy Webb. She also performed a duet of "All I Have To Do Is Dream” with former Soundgarden and Audioslave musician Chris Cornell. Additional harmonies on the album come from Faith Hill, Sheryl Crow, Vince Gill, and Patti Scialfa (who also produced the track “Come See About Me” with Ron Aniello). At the National Christmas Tree Lighting Ceremony in Washington, DC on December 4, 2014, she performed for President Obama and Michelle Obama, and served as co-host of the event. In 2016, Wilson began writing her own songs with the help of co-writer, the Grammy-nominated Kara Dioguardi. The first song she wrote and sang was "Grateful" (later appearing on the self-titled album, Rita Wilson) with Dioguardi and Jason Reeves. Earlier, in 2014, Wilson wrote the song "Bad Things" with Matt Nathanson, for the Scott Eastwood film, Dawn Patrol, in which she also starred. That same year, her second album, Rita Wilson, was released. Wilson co-wrote all the songs on the album with Dan Wilson, Kara Dioguardi, Jason Reeves, Darrell Brown,Sugarland's Kristian Bush, Richard Marx, Lauren Christy, Mikal Blue, Nathan Chapman, Jason Wade, Stephanie Chapman, Ron Aniello, Jillian Jacqueline, Jessi Alexander, JR Randall, Yugomir Lonich, Blair Daly, and Kelly Archer. The song “Strong Tonight” was performed by Connie Britton on the ABC television show, Nashville, in the opening of the episode in which it was included. To support the release of Rita Wilson, she opened on a tour with Chicago; she has said she is a lifelong fan of the band. "I am beyond thrilled to be opening for Chicago, a band who has made up so much of my musical life. Whether I was listening to the band while skiing down a slope or driving in my car, I was always instantly transported to the joy of their melodies and songwriting,” Wilson said. A year later, Wilson presented "Liner Notes: Songwriters, Stories and Music with Rita Wilson and Friends", where she sang, and also invited other singer/songwriters to participate in the event. The show, which took place at the Audrey Skirball Kenis Theater at the Geffen Playhouse in Los Angeles, included Patty Smyth, Desmond Child, Jeff Barry, Kristian Bush, among others. With her third album, Bigger Picture, Wilson drew direct from her personal life for its theme. The album, released September 28, 2018, reunited her with producer Fred Mollin (Johnny Mathis, Jimmy Webb, and Kris Kristofferson); the pair originally worked together on her debut album AM/FM in 2012. Wilson once again wrote originals such as the title track and others with Kristian Bush and Darrell Brown, as well as new partners The Warren Brothers, Lindy Robbins and Alex Reid. The set also included covers of Cat Stevens' "The Wind" and Burt Bacharach/Hal David's "What the World Needs Now is Love." Also, in 2018, Wilson's original song, “Heart Unknown”, was used in the indie film, Simple Wedding. She performed the song, which was co-written by Wilson along with Josh Alexander, Kara Dioguardi, and Mozella. In addition, she performed "Sometimes Love", co-written with Grammy winning producer David Hodges, for the independent film, Emmett, in which she also stars. On March 29, 2019, Wilson released her fourth album, Halfway to Home which included "Throw Me a Party, a song inspired by her survival from breast cancer. Other songs were created during a writing workshop that partnered her with Mozella, Mitch Allan (Demi Lovato), Kara DioGuardi (Pink), Liz Rose and Krisian Bush. Halfway to Home was co-produced by Nathan Chapman, who has worked regularly with Taylor Swift. "Halfway to Home finds Wilson pulling from musical traditions that revere deep storytelling (Southern California rock, classic Nashville country), which was a hallmark for her growing up," explained Rolling Stone. In the course of her music career, Wilson has performed her songs on Ellen, The Tonight Show Starring Jimmy Fallon, The Late Late Show with James Corden, Jimmy Kimmel Live!, Today, and more. Wilson has been a contributing editor to Harper’s Bazaar magazine writing over twenty-one articles. She also started, and was Editor at Large, of a section on Huffington Post called Huff/Post50, which explored issues and topics relative to people over fifty years old. Additionally, she has written for Oprah magazine. Wilson married actor Tom Hanks in 1988, and they have two sons, Chester and Truman. Wilson has two stepchildren, Colin and Elizabeth Hanks. Wilson has one grandchild, and two step-grandchildren. She is a member of the Greek Orthodox Church. In April 2015, Wilson announced that she was diagnosed with breast cancer and had undergone a double mastectomy and reconstructive surgery. After a one-month hiatus, she returned to Larry David's Fish in the Dark Broadway show. In 2015 Wilson signed an open letter which the ONE Campaign had been collecting signatures for; the letter was addressed to Angela Merkel and Nkosazana Dlamini-Zuma, urging them to focus on women as they serve as the head of the G7 in Germany and the AU in South Africa respectively, meant to set the priorities in development funding before a main UN summit in September 2015 that was to establish new development goals for the generation. For over twenty years, Wilson and her husband, Tom Hanks, have been honorary co-chairs along with Steven Spielberg and Kate Capshaw of the Women’s Cancer Research Fund (WCRF), specializing in raising money for women’s cancers. In 2016, WCRF joined forces with Evelyn Lauder’s Breast Cancer Research Foundation. Wilson contributed to the Moffitt Cancer Center by donating "True Hearts" jewelry made of sterling silver and 14k gold. Wilson has credited Rosie O'Donnell as inspiration for her charitable work, particularly with cancer and children's charities. She and her husband have also for 25 years supported The Shakespeare Center of Los Angeles, going back 1989 when Wilson appeared as Celia in a production of "As You Like It". Their annual Simply Shakespeare event, raises funds to support programs for underprivileged youth. Musicians at the fundraiser have included Paul McCartney, Paul Simon, Jackson Browne, Faith Hill, Tim McGraw, Ben Harper, Reba McEntire, and more. The couple also contribute to other charities including Aids Project Los Angeles, and many more. Episode: "All You Need is Love"
2018 Mamma Mia! Here We Go Again Executive producer Sequel to Mamma Mia! AM/FM May 8, 2012 "All I Have to Do Is Dream"
"Good Time Charlie's Got the Blues"
"Will You Love Me Tomorrow?" Rita Wilson March 11, 2016 "Along for the Ride"
Bigger Picture September 28, 2018 "Bigger Picture"
Halfway to Home March 29, 2019 "Big City Small Town Girl"
^ a b Birth date confirmed at the State of California, California Birth Index, 1905–1995. Center for Health Statistics, California Department of Health Services, Sacramento, California. Date of birth for Margarit Ibrahimoff in Los Angeles, California is October 26, 1956. ^ a b "Larry King Now Rita Wilson". Ora.tv. Retrieved 27 March 2019. ^ Betts, Stephen L. (November 17, 2015). "Rita Wilson Announces New Album, Spring Tour". Rolling Stone. Retrieved 28 March 2019. ^ Dilouambaka, Ethel (March 18, 2018). "Famous Greek Actors in Hollywood". The Culture Trip. Retrieved 28 September 2018. ^ a b c Stated on Who Do You Think You Are?, March 30, 2012. ^ "Rita Wilson, Who Do You Think You Are? ", tracing-the-tree, March 31, 2012; retrieved April 3, 2012. ^ Tom Hanks' wife Rita Wilson breaks down after discovering she had a brother who died as a baby on Who Do You Think You Are. Mail Online, 31 March 2012; retrieved December 3, 2012. ^ "My Big, Fat, Greek Mystery" Archived 2011-07-24 at the Wayback Machine, tmatt.net; September 18, 2002; accessed April 15, 2015. ^ "Season 12 Episode 9." Inside the Actors Studio. Bravo. 14 May 2016. Television. ^ Parker, Maggie (March 16, 2016). "Tom Hanks Recalls Watching Wife Rita Wilson on The Brady Bunch: 'I Remember Thinking, "That Girl's Cute" '". People. Retrieved 28 September 2018. ^ Andrews, Travis M. (February 28, 2018). "106 million people watched 'M*A*S*H' finale 35 years ago. No scripted show since has come close". Stars and Stripes. Retrieved 28 September 2018. ^ a b c d Varga, George (March 23, 2016). "Rita Wilson talks music, cancer & recovery". San Diego Union Tribune. Retrieved 28 September 2018. ^ Loofbourow, Lili (July 5, 2017). "Why Frasier is the best show to sleep to". The Week. Retrieved 28 September 2018. ^ a b "Rita Wilson". IMDB. Retrieved 28 September 2018. ^ Davison, Rebecca (July 9, 2018). "Tom Hanks goes shirtless on romantic beach getaway in Greece with Rita Wilson to celebrate his 62nd birthday". Daily Mail. Retrieved 1 October 2018. ^ Strause, Jackie (March 25, 2016). "How 'My Big Fat Greek Wedding' Became an Indie Phenomenon". Hollywood Reporter. Retrieved 1 October 2018. ^ Willman, Chris (November 24, 2016). "How Rita Wilson Became a Singer-Songwriter for 'My Big Fat Greek Wedding 2'". Hollywood Reporter. Retrieved 28 September 2018. ^ "Five Prominent American Hellenes Featured on Greek Postage Stamps". National Herald. September 7, 2016. Retrieved 2 October 2018. ^ a b "Liner Notes: Songwriters, Stories and Music with Rita Wilson and Friends". geffenplayhouse.org. ^ "Paris 'Mamma Mia!' Stars, Cher, Amanda Seyfried, & Lily James Talk Fashion, Feminism, & the Power of Song". Harpers Bazaar. May 23, 2018. Retrieved 28 September 2018. ^ Weinberg, Lindsay (June 25, 2018). "The Cast of 'Sleepless in Seattle,' Then and Now". Hollywood Reporter. Retrieved 29 September 2018. ^ Stoudt, Charlotte (May 14, 2010). "Theater review: 'Love, Loss, and What I Wore' at the Geffen Playhouse". Los Angeles Times. Retrieved 29 September 2018. ^ "Rita Wilson to star in Larry David's play". Associated Press. December 8, 2014. Retrieved 29 September 2018. ^ MacNicol, Glynnis (June 16, 2011). "Arianna Taps Actress Rita Wilson To Head New 'Boomer' Vertical Huff/Post 40". Business Insider. Retrieved 29 September 2018. ^ Hernandez, Ernio (March 25, 2007). "Rita Wilson and Bronson Pinchot Explore ADD in Distracted as Loomer Play Opens". Playbill. Retrieved 30 November 2018. ^ Antoinette Bueno.Rita Wilson to Debut Solo Album, E! Online, February 9, 2012. ^ "Rita Wilson's New Album "AM/FM": The Soundtrack Of Life". Huffington Post. March 26, 2012. Retrieved 1 October 2018. ^ "2014 National Christmas Lighting at the Ellipse". Georgetowner. January 16, 2015. Retrieved 2 October 2018. ^ a b Goodman, Jessica (March 4, 2016). "Rita Wilson: 'Talking To Me' premieres off her new album". Entertainment Weekly. Retrieved 1 October 2018. ^ Catlin, Roger (April 23, 2016). "Rita Wilson has added 'songwriter' to her long résumé". Washington Post. Retrieved 28 September 2018. ^ Gardner, Elysa (March 9, 2016). "Rita Wilson 'Grateful' for good health, long marriage, new creative outlet". USA Today. Retrieved 17 October 2018. ^ "Matt Nathanson / Rita Wilson Bad Things". allmusic.com. Retrieved 1 October 2018. ^ Walsh, Katie (June 4, 2015). "'Dawn Patrol' an over-the-top surfing family tragedy". Los Angeles Times. Retrieved 1 October 2018. ^ a b Stewart, Allison (April 28, 2016). "Rita Wilson is singing, and she's serious". Chicago Tribune. Retrieved 1 October 2018. ^ Dziemianowicz, Joe (September 25, 2014). "Rita Wilson debuts at the Cafe Carlyle". New York Daily News. Retrieved 1 October 2018. ^ "Rita Wilson". allmusic.com. Retrieved 1 October 2018. ^ Holden, Stephen (February 24, 2016). "Review: Rita Wilson's Peaceful Easy Feeling". New York Times. Retrieved 1 October 2018. ^ Petrucelli, Alan W. (April 15, 2016). "Rita Wilson to tour with Chicago, the band that was 'so much of my musical life'". AXS. Retrieved 2 October 2018. ^ Graff, Gary (September 27, 2018). "Rita Wilson Takes a Hard Look at Her Life In Stark 'Bigger Picture' Video: Premiere". Billboard. Retrieved 1 October 2018. ^ "Rita Wilson". opry.com. Retrieved 1 October 2018. ^ Moreau, Jordan (March 1, 2019). "Kate Hudson, Gabrielle Union Honored by Women's Cancer Research Fund". Variety. Retrieved 27 March 2019. ^ Amabile Angermiller, Michele (November 10, 2016). "Rita Wilson Talks Election, Christmas EP & Awards Season Chances at Billboard Touring Conference". Billboard. Retrieved 28 March 2019. ^ Blistein, Jon (February 21, 2019). "Hear Rita Wilson's Evocative New Song 'Throw Me a Party'". Rolling Stone. Retrieved 28 March 2019. ^ "Rita Wilson Performs 'Along for the Ride' - YouTube". Ellen. March 15, 2015. 3:49 minutes in. syndicated. Retrieved 2 October 2018. ^ "The Tonight Show Starring Jimmy Fallon (2014– ) 7.6/10 14 Jake Gyllenhaal/Paul Reubens/Rita Wilson". IMDB. Retrieved 2 October 2018. ^ "The Late Late Show with James Corden (2015– ) 7.4/10 5 Rita Wilson/Luke Bryan/Sam Heughan". IMDB. Retrieved 2 October 2018. ^ "Rita Wilson Performs Jimmy Kimmel Live!". Huffington Post. May 17, 2012. Retrieved 2 October 2018. ^ Hines, Ree (March 7, 2016). "Rita Wilson talks breast cancer on TODAY Show, stresses second opinion". Today Show. Retrieved 17 October 2018. ^ Wilson, Rita. "Rita Wilson". Harpers Bazaar. Retrieved 2 October 2018. ^ Wilson, Rita. "Rita Wilson". Huffington Post. Retrieved 2 October 2018. ^ Wilson, Rita (February 2008). "Would You Marry Him Again?". Oprah magazine. Retrieved 2 October 2018. ^ "Tom Hanks Biography". Biography.com (FYI/A&E Networks). Retrieved August 6, 2014. ^ "Tom Hanks and Rita Wilson 'welcome third granddaughter'". ^ "Спектар: Живот и стил: Православни Холивуд : ПОЛИТИКА". Politika.rs. 2010-02-28. Retrieved 2012-02-09. ^ "Rita Wilson Has Breast Cancer, Undergoes Double Mastectomy and Reconstructive Surgery". People.com. April 14, 2015. Retrieved April 14, 2015. ^ What to Stream Now. "Sitting Shiva With Larry David". Vulture. Retrieved 2017-02-28. ^ McVeigh, Tracy. "Poverty is sexist: leading women sign up for global equality | Life and style". The Guardian. Retrieved 2015-05-08. ^ Chuba, Kirsten (February 28, 2018). "Women's Cancer Research Fund Honors Sofia Vergara, Jennifer Hudson for Activism". Variety. Retrieved 2 October 2018. ^ H. Lee Moffitt Cancer Center & Research Institute; accessed April 15, 2015. ^ "Simply Shakespeare". shakespearecenter.org. Retrieved 2 October 2018. ^ "Tom Hanks and Rita Wilson are Going to do Shakespeare on Stage in LA". OC Register. February 12, 2018. Retrieved 17 October 2018. ^ "Philathropy Resource Guide". Hollywood Reporter. Retrieved 2 October 2018. ^ Deming, Mark. "Rita Wilson" (biography). Billboard. Retrieved January 21, 2016.